I’ve been working on a room for a clients daughter’s room. She wanted to start figuring out a design for her daughter’s space when she transitions out of the crib and into a twin bed. I was excited to design this room because I know how excited my daughter was when she got her big girl bed. What made it even more fun was being able to see the space in person. I’ve done so many E-designs lately that I haven’t been able to see a client’s space for myself in such a long time. There is just something about being in the space that really gets the design ideas flowing. The only real “item” I was directed to work with was the existing wall color. It is by Benjamin Moore and is called Misty Teal. It is such a fun and vibrant color, I was completely willing to work with it. My client also wanted some coral and some grey…no problem, I said. 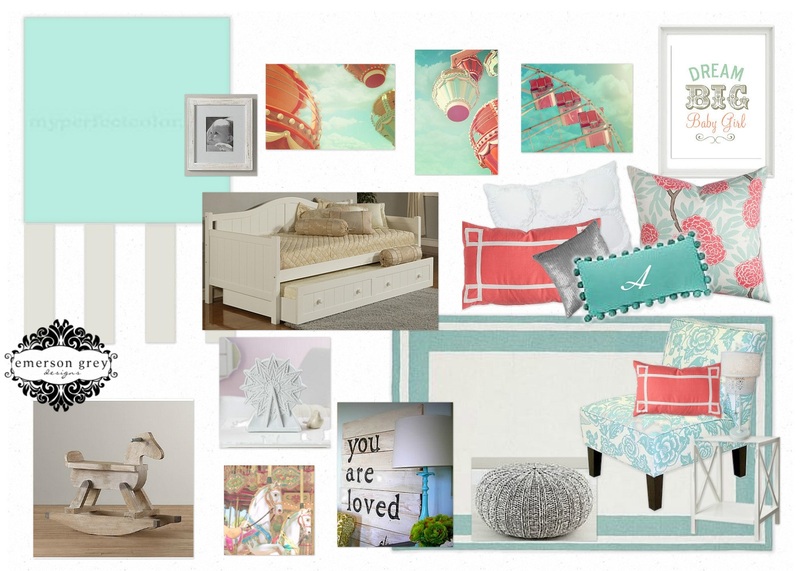 Who wouldn’t want to work with aqua, coral and grey?! I know I was beyond excited. I know this room won’t be completed for a while since her daughter isn’t ready for the transition yet, but when that time comes, I can’t wait to see it! And, of course, I’ll share. For now, here is the primary design board. For clients I always provide 3 other boards to accompany the main board, that way I can break down the items more clearly and provide options where I feel it is necessary. If you are interested in my services feel free to contact me. Out of respect for my paying clients I do not provide sourcing for the above items, feel free to contact me personally with any questions. Be sure to follow me on Pinterest, that is where a lot of my design ideas come together. It looks great! Love that cute rocking horse!